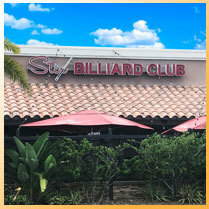 Stix Billiard Club is Stuart’s introduction to what’s hip and cool in regards to an upscale billiard club. Located in the 1580 SE Federal Highway, Stuart, FL 34994. Additionally, we offer a menu that satisfies the fussiest of palettes. Topping it off with a 5000 Watt Sound System to keep the mood going nightly until 1am. Happy Hour Daily from 5pm – 7pm & ALL DAY Happy Hour on Tuesdays!